You could get a a treatment, but I would suggest waiting at least 4-6 weeks for the tattoo to heal. 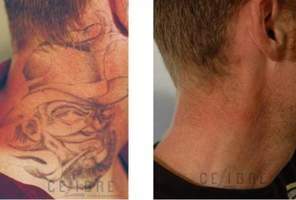 We have seen better results when patients wait for their tattoo to heal and will get better fading. I would suggest keeping the area moisturized and not allow it to scab over. Keep the tattoo out of the sun. You want to also massage the area when it is no longer tender. This will also help with making sure the body does not scar/ or form thickness of the skin.